Roswell Hart can't remember anything about the night her classmate Tricia Farni died, and she needs to start remembering soon - her life depends upon it. Roz is used to living in a hazy world. Macular degeneration has caused her vision to fail her on many occasions, but on the night Tricia disappeared, it's Roz's memory that fails her, not her vision. All Roz can remember from that night is that she and Tricia had a fight. What happens after that is completely erased from her memory. But when Tricia's body is pulled from the Birch River six months after she disappeared, Roz is now a suspect in a variety of crimes, including Tricia's death. Soon Roz finds herself being questioned by the police to which she doesn't have any answers, other than just one: she didn't do it. And she's determined to get to the bottom of who did in order to clear her name. 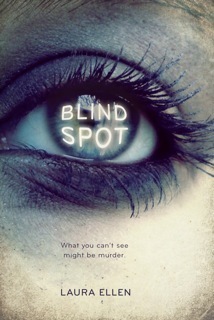 Blind Spot is an amazing story that helps to fill a hole in modern YA literature: the mystery. There just aren't that many YA writers doing mystery these days and I love that Laura Ellen is helping to change that. While I did have some issues with the story, on the whole, it was heart-pumping and page-turning. It took me a while to get into the book, but then once I did, I stayed up until 2 a.m. finishing it, which I haven't done with a book in a long time. While Laura Ellen writes some interesting and believable characters, at first Roz's self-consciousness about her eyes was pretty much the only thing with which I could empathize. While I have never experienced macular degeneration, I was born with lazy eye in both eyes that has left it difficult for me to look people directly in the eye. Roz's vision problem affects her in social situations because most people think she's being stand-offish by not looking them in the eye, but it's really because she can't see someone if she looks at them head on. Even though our reasons for not looking people in the eye are different (mine are more self-conscious than vision reasons) I have had many people assume me to be stand-offish, and I think in a way, my self-consciousness about my eyes has kind of made me that way. So in that regard, I really felt for Roz. But I digress. As I mentioned, Roz was an extremely difficult character to like in the beginning of the story and throughout much of it for that matter. It is clear she is flawed and damaged and you just want take her by the shoulders and shout, "WHAT IS WRONG WITH YOU?" At the same time, finding her a frustrating character to get behind felt like it was by design. She is not so frustrating that you don't find yourself rooting for her and wanting her to finally come to her senses. Because of all the people who have disappointed her throughout her life (an absent father and a neglectful mother for example), it's easy to see why Roz makes poor choices. And of course, the one person who is always there for her, Greg, she treats like garbage. At the same time, this frustration with Roz is also what makes her a believable character. Lots of teenage girls fall prey to user boyfriends and so often fail to see the one person who's always been there for them. Another element of the story I really enjoyed was Roz's relationship with the students in her Life Skills class. Because of Roz's vision problems, she is on an IEP (a special ed acronym for Individual Education Plan) which for her means, in addition to specific classroom accommodations, she must also take this Life Skills class to help her cope with her disability. But with a despot of a teacher, the only Life Skills Roz learns in that class are how to deal with power-tripping authority figures and how to get a group of misfits to find a way to stick together. Despite Roz's resistance to be in the class at the beginning of the book, her interaction with the students ends up being what helps me get behind her. Overall, Blind Spot is a solid, page-turning debut novel that I highly recommend for anyone seeking out more YA mystery in their lives. I'm looking forward to reading more Laura Ellen novels in the future. Cover comments: Wow! What an intriguing and unusual cover that perfectly captures the mysterious nature of the story. And despite the fact that the eye is clearly that of a female, I daresay it might not scare boys away from reading it, my biggest pet peeve of the current climate of YA covers. I agree - there is definitely a void for YA mystery. I really love the cover of this book, and mysterious aspect sounds intriguing. :) Lovely review!